The value of utilising qualitative research approaches to identify, describe and evaluate the impact of health information systems upon healthcare processes is becoming increasingly clear. The use of grounded theory has increased over the past decade within the health informatics discipline. However, for researchers new to the approach, the theory and conduct of grounded theory can be both confusing and daunting. This paper begins to dispel some misconceptions about the use of grounded theory and aims to assist researchers starting out using grounded theory in health informatics research. 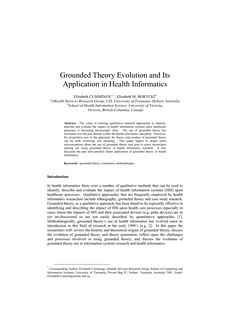 It also discusses the past and potential future application of grounded theory in health informatics.